"‘Each secret is more wonderful than the one before, and each will bring great joy to you and to all the world!'" A small seed is whispered a mysterious message by the wind, foretelling of three wonderful secrets concealed within it. At first, the small seed is perplexed by the message as the wind dances away. The seed is left alone to lie on the cold ground. The days pass, the weather changes, and the lonely seed is soon enveloped in the dark earth. But spring pushes away winter, and the seed is hopeful as it begins to grow, revealing a wonderment. The arrival of summer brings the sun and rains that nurture the seed until, finally, the seed understands each of the secrets once whispered by the wind. The marvels and splendors of the world unfold, and the small seed transforms into a golden beauty. Then a familiar friend returns, and the transformed seed discovers even more about this astonishing transformation. 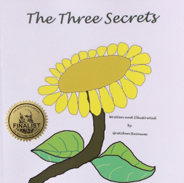 Bainum has written and illustrated an engaging and educational story of the metamorphosis from seed to plant to flower. Her story provides a primary lesson of the life cycle with an inquisitive and encouraging approach. A background in elementary school teaching and art no doubt benefits the author in her storytelling. While at times the narrative appears a bit wordy for a single page, this is compensated for by the appealing illustrations that accompany it. The book’s length is also longer than most standard children’s picture books, but it certainly doesn’t detract much from the overall engagement of the story. In short, Bainum succeeds with this simple and charming tale of a seed’s emotional and uplifting journey.